Ninety-five percent of home gardeners grow tomatoes, largely because they are very easy to grow with a little preparation and knowledge. Good care in each stage of growth ensures a harvest of 10 to 15 pounds of fruit per standard size plant. Heirloom, or heritage, tomatoes are open-pollinated seeds that have not been genetically manipulated. The stages of heritage tomato plant growth are the same as hybrids. Choose tomato plant seeds that suit the local growing climate, according to the USDA plant hardiness zone map. "Better Boy," "Celebrity," "Whopper" and "Brandywine" are established favorites that yield well. Plant the seeds ½ inch deep. They germinate in 5 to 10 days when the temperature is between 70 and 80 degrees F. Seedlings first appear as a single stem with two small leaves called the cotyledon leaves. When tomato seedlings reach 2 to 3 inches in height, they grow their second pair of leaves, which are called “true leaves.” Plants are now ready for transplanting if needed. 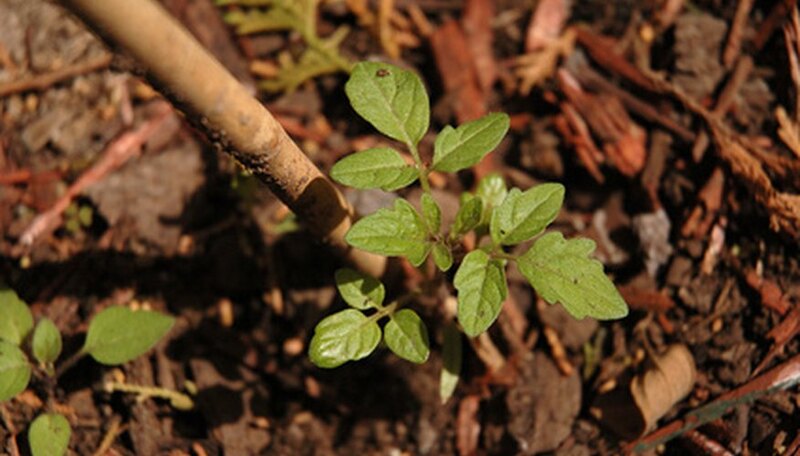 Tomato seedlings grow well when spaced 1 ½ feet to 3 feet apart. As tomato plants reach 5 to 10 inches in height, they develop five to eight sets of lateral branches with leaf clusters. When transplanting a tomato that has become “leggy” from lack of light, place it in a hole with the cotyledon leaves covered. Roots will sprout from this area to create a sturdy plant. 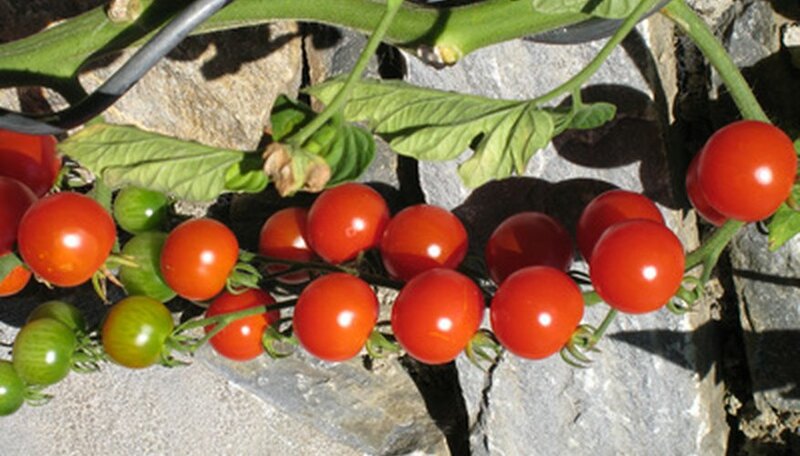 Early variety tomatoes such as "Earliana" and "Early Girl" set fruit at 45 days. Fruit will not set when night temperatures stay below 55 degrees F. Tomato plants should be staked or caged at this time, using cages that are 5 feet tall or taller. In the mature stage of growth, a standard tomato plant is 5 to 6 feet in height. 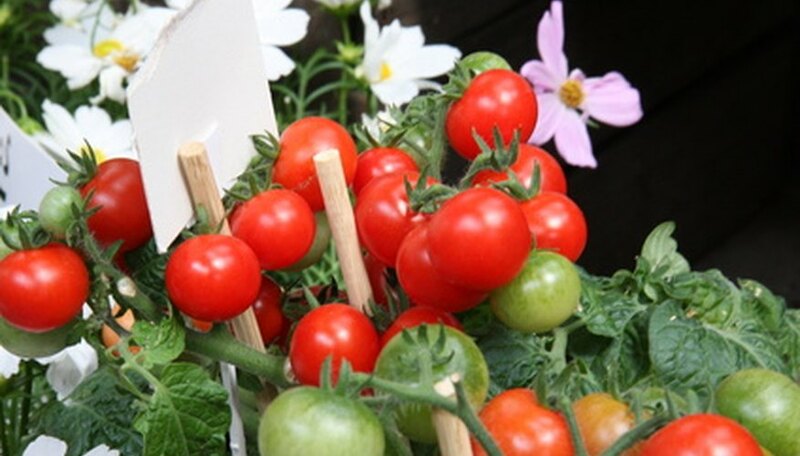 Tomato plants sprawl rather than climb, but they are referred to as “vines." Branches should be tied and trained to wire support systems as they grow to prevent fruit from spoiling on the ground. Tomato plants at this stage of growth are heavy feeders and need an application of organic compost fertilizer each month. Apply it as a side dressing in a circle, 4 to 6 inches out from the plant stem. Dwarf and container tomatoes at the harvest stage of growth are 2 to 3 feet in height. Tomatoes are ready for harvest when they are firm and fully colored. Temperatures over 90 degrees F cause an accelerated softening process and reduced quality. Pick tomatoes every two days during hot weather. One tomato plant yields 10 to 15 pounds of fruit. After tomatoes are harvested, remove vines and place them a compost pile to prevent possible spread of disease.